You seem to already have a WebInterpret account. Start selling internationally in just few clicks! By selling your products internationally you can increase your revenue up to 25% in two months. It's really easy. This is how it works. Daniel Leff is selling jewellery on 6 different markets. With our help his revenue has increased by 43%. Daniel Leff founded his business in 2004 when he started selling fashion jewellery online. Since the beginning, the plan was always to expand internationally, which is why he chose to focus on jewellery as opposed to other products because it was easy to post. From the beginning, he has always been looking for ways to expand into other markets. He experimented on various platforms but was always disappointed by the insufficient sales volume they generated. That's why he decided to start working with WebInterpret. Thanks to WebInterpret within a few days he was able to offer his products on six international eBay sites. Like all of WI clients, Daniel was first granted a free trial of the WebInterpret solution but he decided to upgrade to the Premium package immediately in order to benefit fully from the service. After a few months he decided to expand further and started using the WebInterpret service on Amazon. "It enabled us to make some great sales. WebInterpret made it easy, slick and professional. Why would you choose to miss out on the opportunity of showing your products on so many different markets." How does the free* trial work? Can I select my own list of products? How is the translation done? How much time do I have to create my initial 100 listings? Am I eligible to the free trial? Will it still be free* if I switch to a Pro plan? How long does it take to get my 100 listings localised online? How do I fulfill orders on these new listings? What do I do if I have more questions/ want more information? 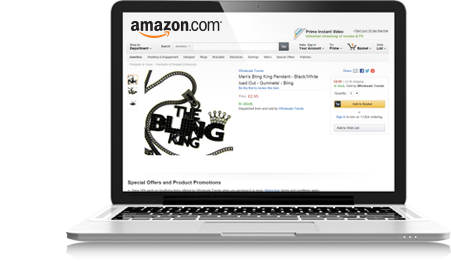 Our free* trial enables you to get 100 top selling items localized in up to 4 Amazon websites in Europe, without any fee or commitment. If you decide to switch to a Pro plan, you will pay fees on all listings, including the initial 100 listings. Create a WebInterpret account or login to your existing WebInterpret account and connect your Amazon account, select in which marketplaces you want to develop your sales and validate your international shipping costs. WebInterpret will automatically suggest a list of your 100 top selling items based on your last 30 days sales. You will then be able to remove and replace any items from this list. WebInterpret has developed a unique language processing technology which includes manual checks by our professional e-commerce translation team. It is equivalent to a human professional translation quality. Official size conversion charts are used. For instance if you are selling a particular brand, official size conversion charts from this brand will be used automatically to convert it. You also have the option to specify your own conversion charts. You can create your initial 100 listings for free* at any time after you connected your Amazon account and there is no time limit. If you like the service and want to create more products you will just have to upgrade your account to a Pro plan. While we offer different business models, most of our customers choose revenue sharing model, ie WebInterpret charges a success fee on the sales generated only on the listings created by WebInterpret. You are eligible for free trial providing your monthly domestic revenue is not lower than £400. We encourage you to acquaint yourself with PAYG plan if free trial is not an option for you. No, the plan will apply to all the listings created with Webinterpret. Therefore, you will pay fees on all listings, including the initial 100 listings. You should have your 100 listings live in less than 15 days. You will be able to fulfill these orders in the same way as you fulfill your domestic orders. You will also be able to see your sold items in your European Amazon account and any third party software that you use to sell on Amazon.